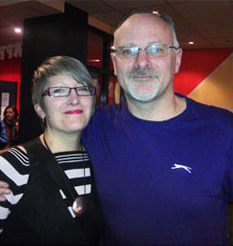 Pip, 45 and Tony 51, have known each other for 38 years and been married for 20. 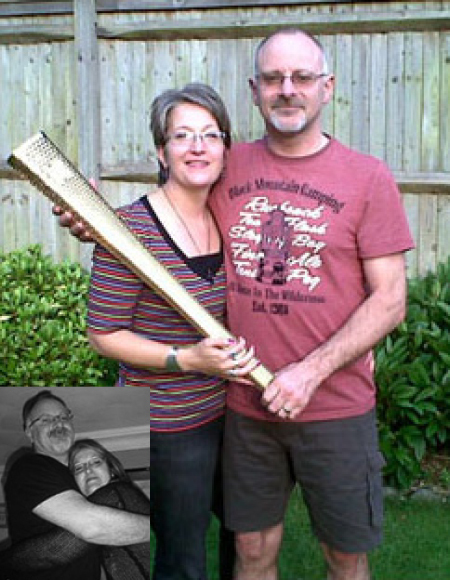 Together they successfully lost over 40 inches and 4st 4lbs60lbs27.2kg in just 5 months. They have 2 sons aged 8 and 15. Pip says....Tony works incredibly hard and his work hours and job are stressful, so keeping fit and taking control again of our lives felt very important. We saw some horrible photos of ourselves from Christmas 2011. Tony had already found the website before the festive season, and suggested we joined after the New Year, which we did! And thank goodness we did - those photos were awful! We both felt so uncomfortable in ourselves and knew something had to change. I'd also had a major operation in July 2011, and although inside I finally had my health back on track which felt amazing, I wanted the outside to mirror this - a new happy me! The children were such a boost and became our inner nagging consciences. They would remind us not to pick at foods, snack on the wrong things, or ask us "do you really want or need to eat THAT Mum/ Dad?" Why did you choose this way to lose weight? Tony thankfully found the website online while searching for weight loss programmes. He clicked on it, it looked different and easy, fun, and the forum support appealed to me. So we joined, we lost weight, and the rest as they say, is history! Fat, frumpy, tired, and huge. Unhappy with how I looked and apart from when I was pregnant, I had never been that big! 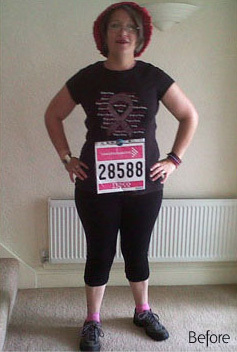 (I was a size 18 at 5 ft 2" and weighed 11 stone 8lb. Tony, who is 5ft 8", weighed 13st 12lbs194lbs87.9kg and had a 36" waist). Over the years the weight snuck up on us, and before we knew it, we were much bigger than we wanted to be. Our clothes didn't fit, it felt uncomfortable to bend or sit and we had gone up a few clothes sizes too. Our BMIs were tipping the obese levels, which was scary in itself. We had to make changes to lose the excess weight before we got even bigger. Not only for us, but more importantly for our children's sake long term. We want to be here as long as possible for them. What has the food diary taught you? The food diary has taught us we only get one body, and we must look after it! It's down to us to watch what we eat; control the portion sizes, drink more water, and yes you can still have treats just not to excess. I don't snack much these days and if I do it's the right things. Entering everything we eat or drink into the diary makes you realise where those calories were coming from, and in our case, quite how much extra dairy we were consuming, without realising. Our portion sizes are correct now and we never deny those little extras as this is not a "quick fix" nor a diet, but a new life. We save the treats for weekends, balancing them out with our 5-a-day and exercise. What are the biggest changes you've made? Did this affect what you cook for the family? I think more about what and when we eat. Also the correct portion sizes - not just for us, but for the children too! Everything is way more balanced now and I don't even have to think about it really. 13 months on and it's easy to plan healthier, tastier meals from scratch, which is not only better on the waistline, but also I know what goes into our food. I read labels now so I'm more aware of what is in food (due to our younger son having allergies to certain foods, I was careful reading ingredients anyhow). I also don't snack whilst clearing the children's plates of leftovers, or eat extras while I cook them as before. I add the foods into the diary BEFORE I cook them to make sure we stay within my allowance for fats and calories, rather than eat it and it's too late! Being a support for each other, especially in the evenings, then the everyday long-term support you get on the forum really boosts you. Working as a team at home, as well the virtual team of amazing forum members we have online, really helped boost the weight loss and keep us focused. Our lives have improved SO much - it's not just affected what we eat, but how we are as a couple. We know it's fine to go over our allowances sometimes, (we save treat days for weekends) - you wouldn't be human if you didn't feel the need to treat. And you must love yourself along the way and not feel guilty about what you eat, just everything in moderation for us was the key. Being aware! Did you decide together or did one of you start and that spurred the other on? Have you tried any other diets and how did you get on? Yes we had tried other methods of losing weight in the past (weird fad diets! ), with little success. This time we wanted something easy, without counting points, no odd food combinations or shakes, just a new lifestyle change which this gave us. We gained control back, but it was never a chore doing it. We learned a lot too and soon saw easily, just how and why we had piled the weight on in the first place. But more importantly, how to change our way of thinking, lifestyle and eating habits to successfully lose the excess weight and remain healthy long term. How did slimming together help you keep going and focused? We made a great team - we would text each other making sure we were not sneaking anything we shouldn't eat. I always knew if Tony had eaten something he shouldn't have - his face as he came in the door said it all! Along with the phrase "Oh Diet guru, I have sinned....." hee hee. We lost over 40 inches between us, and 4st 4lbs60lbs27.2kg by July 2012 - in just 5 months! We are healthier and way happier! The children noticed the difference immediately. We are more energetic, for instance I went in the sea and swam for the first time in years with my sons in Cornwall on last year's holiday. The year before, I sat there feeling low and hiding myself away. I was angry at myself for missing out on our special time with the family, so I vowed to change. BUT it's one thing to keep promising yourself and quite another to motivate yourself and actually implement your plans and dreams. Thankfully I managed it. I feel good about myself now, in turn my confidence has returned and grown. Tony is happier and healthier than before, and feeling comfortable in himself. We do more walking with the children now and get out and plan more at weekends, and have the energy to do it! Plus we are happier as a couple and I am proud to be shown off by my lovely, slimmer husband. I currently weigh 9st 2lbs128lbs58kg and am at my goal of a size 10 again! Tony is 12st 8lbs176lbs80kg currently and still losing. It's easy when you know how, and weight is no longer a problem. Thank you to Tony, our children, and the wonderful forum support. It's given me not only my pride in myself again, but added confidence to chase our future dreams.